Manti’s Travis Thompson, No. 12, hops over a tumbling Cowboy on his way to the end zone. Thompson and Manti QB Kyle King proved to be an effective team in the game against Grantsville, but not effective enough. 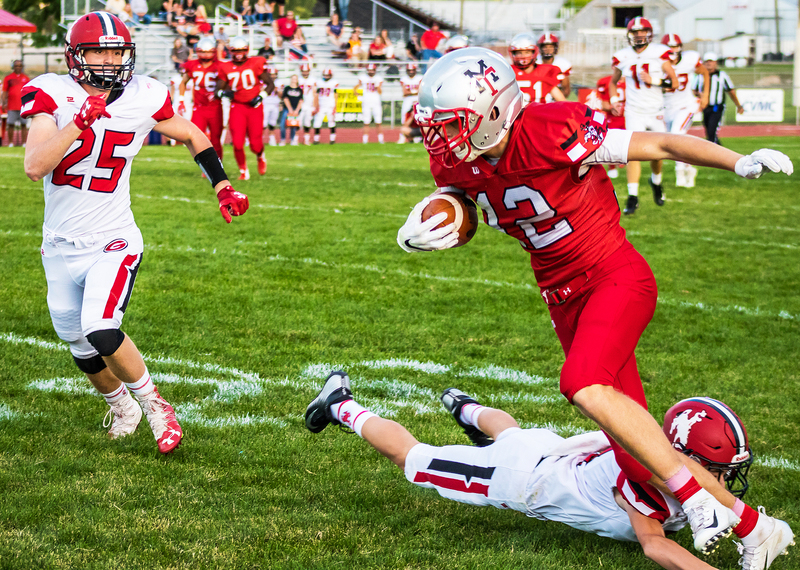 Despite big plays like a 74-yard touchdown pass from King to Thompson, Grantsville came out with a 28-14 win. Manti’s Adam Huff leaps for a pass that would end up out-of-bounds during the team’s loss against Grantsville on Friday, Aug. 31. MANTI—On paper, the Manti Templar contest with Grantsville last Friday appeared to be a two-man passing threat against a one-man rushing attack, with the Cowboys coming out ahead after three quarters of tied football to win, 28-14. Of course, anyone who understands team sports knows that is not the case, but you could make that mistake if you were looking only at statistics. Because in a game where two teams battled neck-and-neck toward a tie that lasted halfway into the fourth quarter, the game was a showdown between the Templar combo of QB Kyle King and his teammate Travis Thompson, versus Grantsville’s seemingly unstoppable junior ball-runner, Parker Thomas. In fact, throughout the whole game, special teams excluded, King, Thompson and Thomas were the only players putting points on the board. 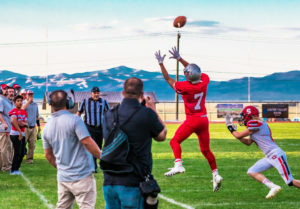 Manti coach Cole Meacham said King and Thompson have been clicking together well in the games so far, and support from other players on the receiving end, such as Adam Huff, have helped the team continue to improve their passing. Four minutes into the first quarter, Thomas ran in the first touchdown, followed up by a successful kick by Dayne Linton. Barely more than a minute later, Manti answered back when Thompson scored after catching a 74-yard rocket launch from King. Seth Cornelsen kicked the extra point. But the Templars were in for more trouble from Thomas in short order. Less than a minute after Thompson’s touchdown, the Cowboy galloped 67 yards in to score again. The first quarter wrapped up with Grantsville leading 14-7. Not to be unseated from their 2-0 record so easily, with a little more than 9 minutes into the second half, Manti worked its way up the field, and King threw the ball again into the waiting arms of Thompson, followed immediately by another extra point from Cornelsen. That is when it all ground to a screeching halt. For nearly a third of the entire game, the teams maintained a scoreless stalemate. Meacham says the defensive plays during the stalemate were from adjusting their own defensive strategy, and a strong defense coming from Grantsville as well. The tie would only last so long, however. Grantsville once again had Thomas to thank when he ran in another touchdown with nearly 5 minutes left in the fourth. Linton tacked on the extra point for the Cowboys. The Templars where still hitting a brick wall offensively. They would not score again during the game, but Thomas would score one last time. With 15 seconds to go before the game was over, Thomas pushed his way through to his fourth touchdown of the game, Linton added the final point of the night, and the Cowboys walked away the undisputed winners. Now sitting at 2-1, the Templars will face the Emery Spartans (0-3) on Friday in an away game.